Jon Jones will be out of action until at least July 2017 after he was suspended for one-year following his arbitration hearing with USADA last week. Jones was the first athlete on the UFC roster to go to arbitration with USADA (United States Anti-Doping Agency) after he tested positive for a banned substance ahead of his last scheduled fight with Daniel Cormier at UFC 200. The three-person panel heard Jones' case alongside his attorney Howard Jones in Los Angeles and ultimately returned with the maximum penalty allowed, which was 12-months based on the substances found as a result of the positive drug test. “Jones’ one-year period of ineligibility began on July 6, 2016, the date of his provisional sanction. 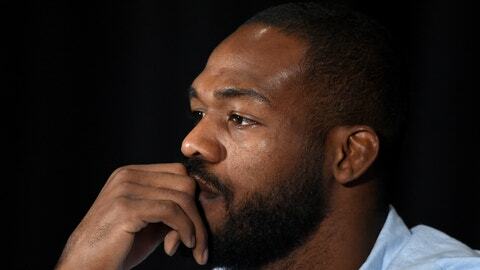 In addition, Jones has been disqualified from all competitive results obtained on and subsequent to July 6, 2016, including forfeiture of any title, ranking, purse, or other compensation,” USADA officials wrote in a statement released on Monday. USADA also released the full resolution to FOX Sports with the ruling from the arbitration hearing with Jones. According to the documentation, Jones tested positive for hydroxyclomiphene and letrozale metabolite — two anti-estrogen drugs that are banned at all times — from an out of competition sample that was collected on June 16. At that time, Jones didn't declare any supplements or other substances he was taking. During the arbitration hearing, Jones claimed that he believed he was taking “Cialis” — an erectile dysfunction medication — after verifying the drug was not on the WADA (World Anti-Doping Agency) banned substances list. Jones claims he took a pill called “Tadalafil”, which is the active ingredient in the brand name Cialis medication. Unfortunately, the pill was reportedly manufactured by a company called All American Peptide with “standards far less rigorous than those required by the US Food and Drugs Administration” according to the arbitration resolution. Jones maintained that he was unaware that the pill he took contained any banned substances and he was the victim of a contaminated product. Ultimately, the panel agreed that Jones didn't knowingly take a banned substance, but still opted for the full penalty allowed in the case. “On the evidence before the panel, the applicant is not a drug cheat,” the arbitrators wrote in the final epilogue in the resolution rendered. “He did not know that the tablet he took contained prohibited substances or that those substances had the capacity to enhance sporting performance. Jones was expected to face Cormier in the main event at UFC 200 when he was pulled from the card just days before the show took place after the positive drug test was returned. Now he will not be eligible to fight again until at least July 6, 2017 after receiving the one year suspension from USADA. Jones still has to go before the Nevada State Athletic Commission for an additional hearing on the matter because the drug test was administered in close proximity for his fight taking place in the state. Unfortunately, Jones was expected to receive that hearing on November 10, but the commission has now asked for a continuance in the matter. That means Jones won't likely appear before the Nevada Commission until at least December to determine if the state will abide by the same suspension as USADA or potentially add more time onto his suspension.